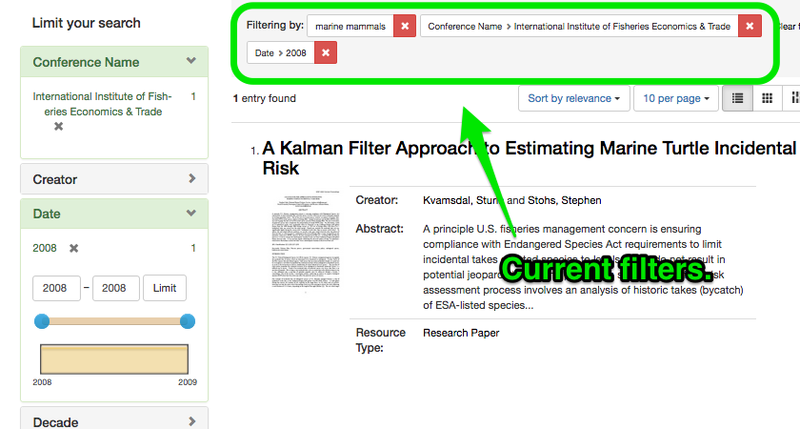 To search for content within the repository, enter keywords, authors, and other terms in the search box at the top of the page. This will search for terms that reside in author, title, abstract, subject, academic affiliation, conference name, conference location, conference section, advisor, committee member, date, degree name, funding body, funding statement, hydrologic unit code, location, series, publisher, resource type, and several other metadata fields. In the previous version of ScholarsArchive@OSU, content was organized into communities and collections. While that is no longer the case, after doing a keyword search, use the facets on the left side of the page to limit your search. You can limit a search to items that once resided in a specific community or collection by choosing a facet associated with that community or collection. 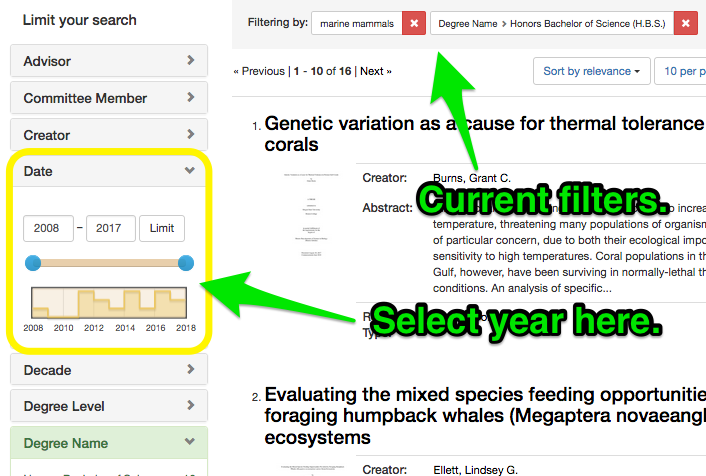 You can also limit a search to content published in a specific year or range of years, authored by specific people, on particular topics, and so on. 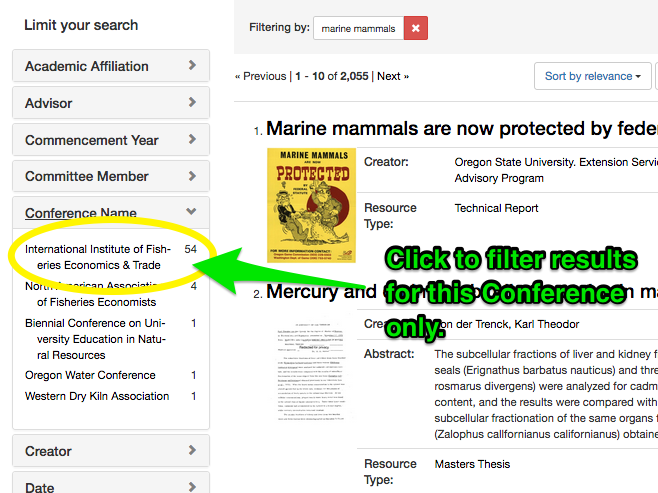 For example, let’s say you want to find papers on the topic of marine mammals, given at the 2008 International Institute of Fisheries Economics & Trade conference. First, do a search for “marine mammals”. This will produce results including masters theses, journal articles, technical reports, conference posters, as well as conference papers. Now take a look at all the facets in the column on the left-hand side of the screen. Choosing any of these facets will limit your search results. One of the facets is Conference Name. Choose International Institute of Fisheries Economics & Trade. To limit your search to a particular year of that conference, choose Date and select the year you are interested in. At the top of the screen you can see all the search parameters you have applied so far. For example, say you want to find honors theses on the topic of marine mammals. First, do a search for “marine mammals”. This will produce results that include master’s theses, journal articles, technical reports, conference posters, as well as conference papers. Now take a look at all the facets in the column on the left-hand side of the screen. Choosing any of these facets will narrow a large set of results down to only those that match that one specific criteria. One of the facets is Degree Name. Choose Honors Bachelor of Science (H.B.S.) there to narrow your search to Honors College Theses in the repository. If instead you’re looking for master’s theses, choose one of the two Master’s degrees under Degree Name or “Master’s” under Degree Level. To further narrow your search to a particular year, choose the Date facet and select the year you are interested in. To further narrow your search to theses associated with a specific academic affiliation, choose the Academic Affiliation facet. At the top of the screen you can see all the search parameters you have applied so far. You can always remove a search parameter here. 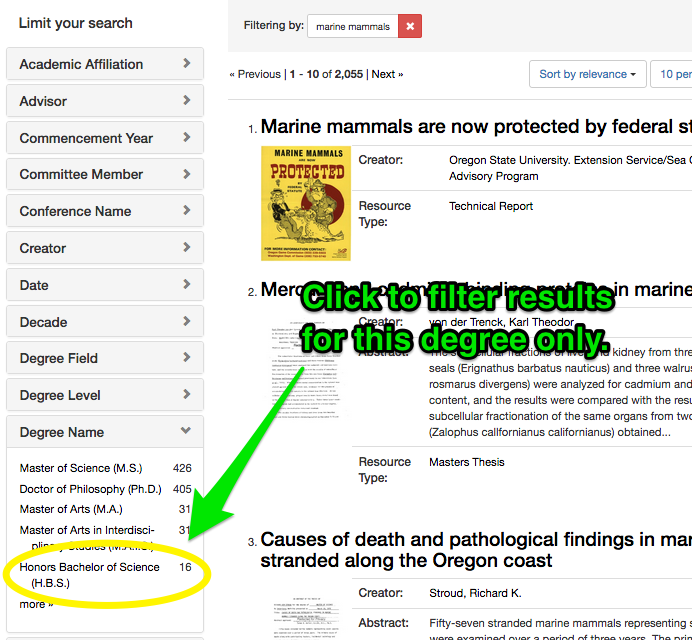 Soon, ScholarsArchive@OSU will again have collection functionality that includes the ability to search within a collection. In the previous version of ScholarsArchive@OSU, content was organized into communities and collections. Now, all items are in the same big bucket, but you can limit a search using facets. You first need to do a keyword search. Then, use the facets that appear along the left hand side of the page to limit your search to items that once resided in a specific community or collection. For example, click on the “Academic Affiliation” facet to limit the search to items from a particular OSU department or college. 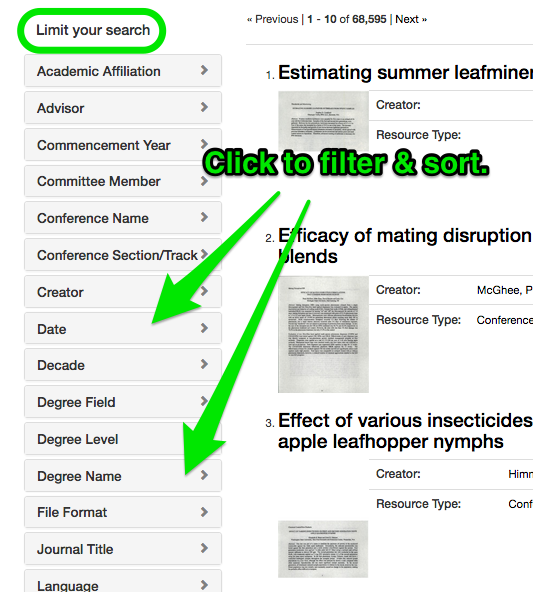 Or, click on the “Conference Name” facet to limit the search to a particular conference. 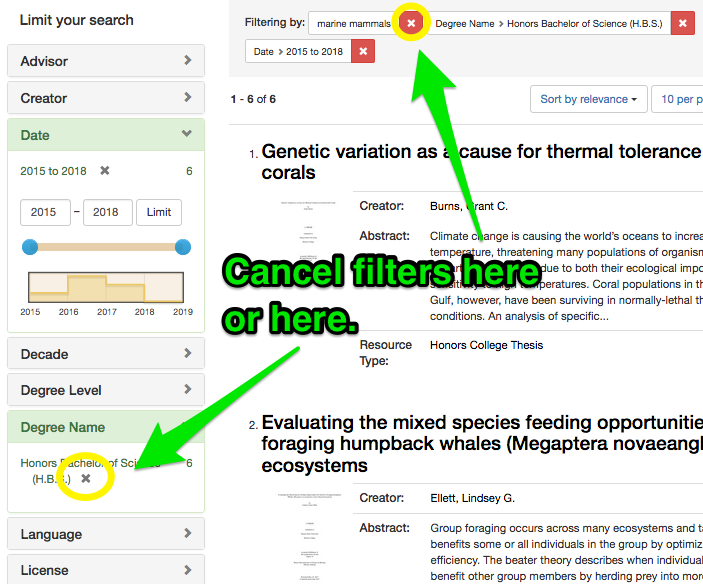 You can also limit a search to content published in a specific year or range of years, authored by specific people, on particular topics, and so on. Advanced search options will include the ability to search within specific fields and across multiple fields with a single search.